Set predominantly in the Cabinet Office at 10 Downing Street between 26th and 28th May 1940, at a point when Hitler’s lightning sweep through Europe had pushed Belgium and France to the point of surrender and trapped large numbers of British troops, Ben Brown’s new play Three Days in May looks at the weight of responsibility that fell on Churchill and his War Cabinet. Behind closed doors, the prospect of going it alone against the Nazis was weighed up against the possibility of suing for some kind of peace terms at a pivotal point in British history, played here in a Bill Kenwright production at Richmond Theatre, part of a UK tour. There is little drama in Brown’s play – given that much of the history is well-trodden territory and the ‘action’ revolves around a series of Cabinet meetings and the politicking inbetween, this is hardly surprising. But there’s little attempt by Brown, or by director Alan Strachan to really address this through an alternative approach and so what we are presented with is curiously flat and weighed down through overuse of silences. Imposing a narrator – Churchill’s young private secretary Jock Colville – to frame the play and loading him with exposition and historical detail makes for a difficult opening, more akin to a history lesson, and the first act – perhaps even the entire play – never really escapes this to kick into life. 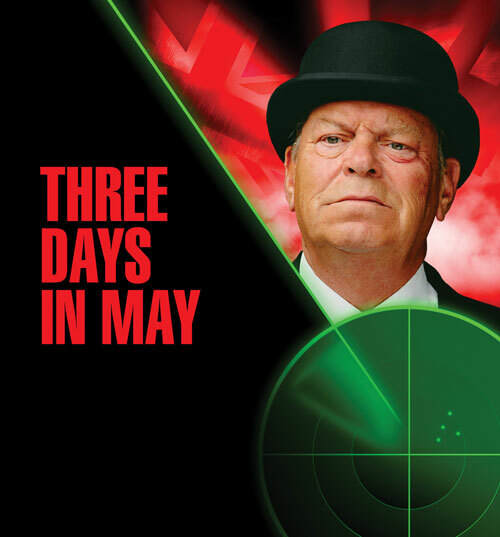 Kenwright has secured Warren Clarke’s first stage appearance in over a decade as Winston Churchill and it is an impressive performance, albeit one that sometimes feels closer to an impersonation. Clarke inhabits Churchill’s voice with unerring precision, though losing some clarity at times, and presents the familiar cigar-puffing, whisky-swigging demeanour well. But the writing doesn’t really allow him to mine beyond the public image and familiar soundbites no matter how convincingly they are barked out, presenting an oversimplified approach to the horrendously complex geopolitics of the time and cleaving a little too closely to the self-aggrandising myth perpetuated by Churchill himself in his memoir The Gathering Storm. It is only in the second act that there is a shift to something more interesting as the focus is more on the moments inbetween the meetings and some shades of characterisation are allowed to develop. Robert Demeger’s beautifully haunted Neville Chamberlain is allowed a few moments of reflection in his former office – though he resigned as Prime Minister, he was still an integral part of the War Cabinet and so unable to escape the scene of his recent humiliation. Likewise, Jeremy Clyde’s intense Lord Halifax is given a little room to articulate his support for appeasement in order to, as he fervently believed, save the nation. But these are only glimpses of the men behind the stiff upper lips and the history books and biographies and so there is ultimately little respite from the rather staid, lecturing atmosphere that permeates this play. Even after James Alper’s appealing Colville gets his little opportunity to flesh out his character, he is inevitably forced back into the narrator role to round up events and provide a neat salutary conclusion. Overall, the urgency of the situation is never translated onto the stage, despite Gary McCann’s clever world-map-based design giving us the visual cue, nor is there any real psychological insight offered into these men or their ideological positions. By adhering too closely to Churchill’s version of events and presenting him unchallenged as a heroic visionary, Three Days in May suffers from the dullness that accompanies anyone smugly going on about how right they were – as the bulldog himself said, “history will be kind to me, because I shall write it”. But Brown also misses a trick by not adding historical value and interest in fully exploring how and why appeasement was considered such a viable option by the establishment, rather than dismissing it from the outset, thereby providing something different. Ultimately though, Warren Clarke’s performance aside, this is a piece of theatre that struggles to either entertain or educate. Booking until 3rd September then touring to Cambridge, Bath, Malvern, Brighton, Milton Keynes and Guildford. A West End transfer has been rumoured but nothing confirmed as of yet.